Stone Horse Expeditions & Travel provides horse riding vacations in the cultural and wilderness landscapes of Mongolia’s Gorkhi-Terelj National Park and the Khan Khentii Strictly Protected Area (Wilderness). These two protected areas combined make up the largest road less area in the country, where one can experience the nomadic herding and horse culture of Mongolia in scenic forest steppe and wilderness settings. The Khentii Mountains were the home ground of the young Chinggis Khan, where he honed his skills as a horseman and warrior. The ancient trails and tracks, mountain passes and river crossings that Stone Horse Mongolia Horse Riding Expeditions travel are the very same Chinggis and his armies rode upon as they built a nation. Stone Horse Expeditions' horses are the same sturdy breed used for centuries in Asia. They are slightly smaller than horses found in North America and Europe, but very tough for mountain travel. Although Mongolian saddles are interesting and quite beautiful, Stone Horse uses custom Western saddles from their own workshop that are comfortable for both horse and rider. Tented camps and ger (yurt) sites for each nights' accommodations are chosen for their wilderness beauty and solitude to give guests a special experience on their horse riding holiday. Stone Horse Expeditions spent the past 20 years riding through this great area, exploring, meeting with nomadic herders, making local friends and developing Mongolia horse rides to make them interesting and enjoyable. 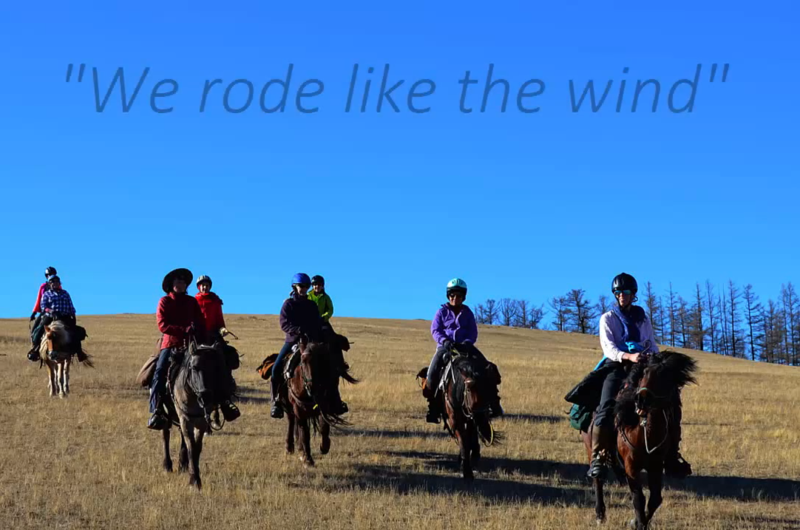 Sharing this with guests, giving insight into the nomadic world and horse culture of Mongolia, brings the guides at Stone Horse a special pleasure. The hosts and owners of Stone Horse Expeditions & Travel, lead the trips and oversee the packing, camp and cooking. The team on the expeditions is complimented by Mongolian staff, who are happy to share the culture and history of their country with travelers. They are young horsemen and women who grew up on horseback in the Mongolian countryside. Check out the 2019 Expedition Schedule. Stone Horse has different trips lined up beginning in mid June and running through mid October, from the wildflowers of summer to the brilliant colors of autumn, to the Wilderness Conservation Adventure. Guests stay in spacious tents with comfortable air mats and sleeping bags while on the trail during these Mongolia riding holidays. The camps are chosen for their outstanding beauty and solitude to give guests a real sense of wilderness. On special days, visit and stay in a traditional Ger (yurt) camp as you travel on horseback through the park. The first and last nights of each trip are in hotel accommodations. Food is sourced locally and flavored internationally and wine is a feature of pre-dinner offerings on the trail. Your hosts like to ensure that meals are tasty and nourishing for the days of riding ahead. Breakfasts include mueslis, breads, eggs, pancakes, tea and coffee; picnic lunches at scenic sites include bread, cheese, sausage and spreads, fruits, snacks, hot and cold drinks; upon arrival at the campsite, tea and biscuits are offered and soon, to be followed by wine and snacks; dinners consist of soups and salad and entrees such as steak, pasta, curries, chili, and goulash. Vegetarian and Vegan preferences can be accommodated with prior notice. Stone Horse Expeditions' Mongolian team members mostly prefer their traditional local food, and a hearty meat and noodle soup is usually prepared in the camp kitchen as well. A grill and Dutch Oven are carried along during these riding holidays, so fresh bread can be baked in camp! In the cooler season, meals are served in heated wall tents. Otherwise, the dining table is outside – with scenic views and the horses “dining” on wildflowers nearby. Gorkhi-Terelj National Park and the Khan Khentii Strictly Protected Area – with both their cultural and wilderness landscapes, and historic sites. In Ulaanbaatar Capital City: Natural History and Cultural Museums, traditional music and dance concerts, cashmere clothing shops, traditional Mongolian and International Restaurants, Buddhist temples and monasteries, and the colorful 3-day Naadam festival with traditional horse racing, wrestling and archery (July 11-13).